Groom your Whiskers with Whiskers Power Beard Oil, an exotic non sticky beard grooming product from Whiskers. Immaculately prepared with combination of choicest essential oils along with nourishing minerals and vitamins it is a go to product for a well-conditioned, healthy and lustrous beard. A heady concoction of natural ingredients Apricot oil (Prunus paradoxa), Wheat germ oil (Triticum vulgare), Jojoba oil (Simmondsia chinensis), Argan oil (Argania), Grapeseed oil (Vitis vinifera) clubbed with nourishment of Vitamins and minerals. Whiskers Power Beard Oil makes your beard cottony soft, frizz free, manageable and shiny. Whiskers Beard Growth Oil has been specifically crafted to promote the growth of beard and facial hair offering a perfect blend of natural ingredients for a shiny, soft appearance of your muscularity’s cardinal symbol. 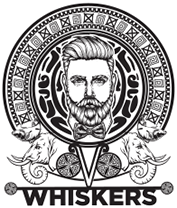 At present this unique oil by Whiskers tops the list of best beard oils in India as well as across the globe. Feel a new rush of adrenaline everytime you step out of your home with an application of this top of the line Beard Growth Oil and witness others bowing down out of respect for you. Why You Need Beard Growth Oil? 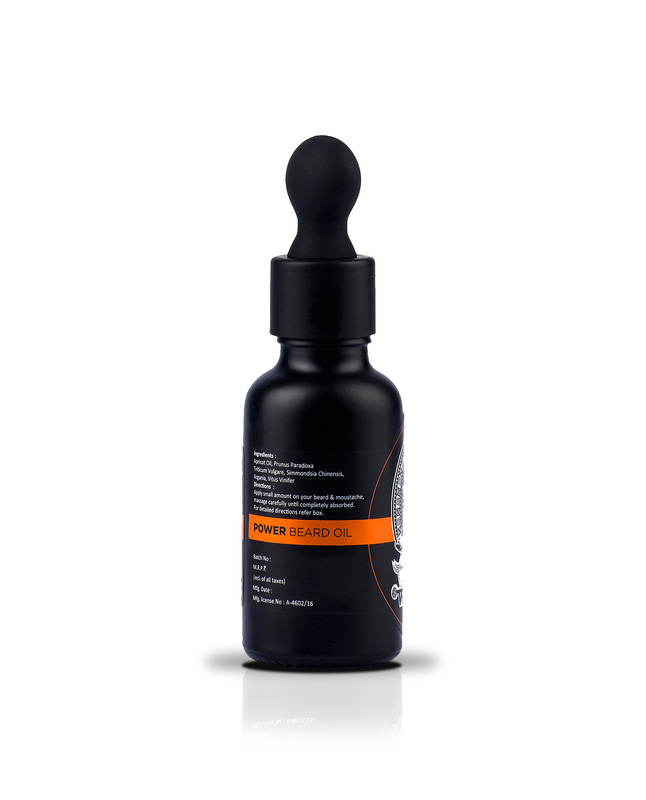 A high-quality Beard Growth Oil such as Whiskers Power Beard Oil acts as a perfect moisturizing agent for your facial hair, penetrating straight into the hair follicle. This concludes in absolute hydration and nourishment of your hair, preventing them from becoming fragile, especially in dry, windy and cold atmospheric conditions. Presence of Jojoba and pure Argan oil results in ideal conditions for the growth of healthy hair, reducing beard hair breakage and making beard look thicker and shinier. Beard hair follicles are planted in glands known as sebaceous glands. These glands secrete ”sebum” which is a naturally occurring oil which envelopes the follicle. As the beard grows longer, the quantity of sebum produced becomes insufficient to moisturize the follicle as well as the skin above it, resulting in dry, brittle hair. A good quality Beard Growth Oil in acts as a savior, coating and nourishing the hair follicles as well as the skin underneath. Moreover it helps in reducing beard acne too. Nothing is more refreshing than the aroma of a pleasant smelling, groomed beard when you step out of your home in the morning to start your day. Contrary to hard, alcohol sporting colognes and perfumes, beard growth oil includes all natural ingredients which not only offers fragrance but also repairs the damaged hair. Acne, the word itself is enough to give sleepless nights to many & Beard Acne seems cherry on top. The primary reason for beard acne is clogging of the hair follicle, resulting in inflammation and blocked pores. Regular usage of Beard Oil helps reducing beard acne as good quality beard oil penetrates deep into hair follicles and unclogs pores resulting in a healthy, smooth facial skin. Moreover majority of people are of the opinion that since beard oil possesses oily characteristics, it might worsen the acne situation. But the truth is that a beard oil only nourishes, cleanses and facilitates the growth of strong beard hair. Experts also recommend the application of beard oil every morning & night after a cleansing with beard wash to deal with the troublesome situation of beard acne. Just a few drops of Whiskers Power Beard Oil daily will result in making your beard more manageable, frizz free & beard acne free. Regular application of Whiskers Beard Oil ensures faster beard growth as well as a holistic hydration and nourishment of the facial skin beneath, healing itchiness. You don’t have to hunt for three distinctive products to garner an all-rounded protection and nurturing of your beard. 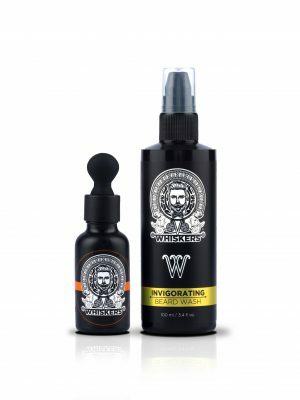 Whiskers offer Power Beard Growth Oil offering 3 exceptional features offering smooth, lustrous and thick beard, furnishing user with a rejuvenated look. Power Beard Oil also incorporates captivating lavender scented oil which stays with user for a significant time after the application of the oil. The aromatic fragrance of the oil not only adds in happy and energetic mind, but its healing characteristics also promote a healthy beard growth. What’s more, there is no age limit for applying Power Beard Oil as it is made of all natural ingredients including essential oils which are suitable for individuals of any age. Bonus is it is free of any sort of Harmful Chemicals. How Whiskers Power Beard Growth Oil is Different & Better? 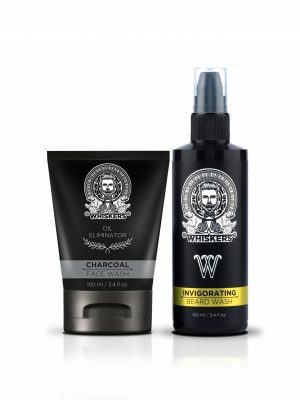 Whiskers Power Beard Oil is among the best Beard Oils in India and is manufactured after synthesizing the world’s finest oils with vitamins and nurturing minerals to help you boast a healthy, radiant, thick and glossy beard. Apricot oil which is present in Whiskers Beard Growth Oil is a rich Vitamin A source which prevents premature greying and aging of beard. It has amazing moisturizing capabilities giving beard hair an incredible shine & strength. Another exceptional moisturizing agent, Almond oil found in the Whiskers Beard Oil comprises of Omega 3 fatty acids, Vitamin E and Magnesium which helps in treating damaged beard hair and beard hair loss. Almond oil also offers ample nutrition to hair. A pivotal component of Whiskers Power Beard Oil, the jojoba oil moistens beard to the core, bolstering its hair growth. Whiskers also has infused Grapeseed oil containing vitamin, proteins, minerals and linoleic which catalyzes hair nourishment and growth, ensuring a rejuvenating look. Step 2: Now take few drops of Whiskers Beard Growth Oil into your palm and gently rub it through your beard starting from the neck and steadily moving up. Step 3: Ensure to rub the oil into the skin beneath the hair from where the beard sprouts. Now reverse the motion and run fingers through your beard from top to bottom ensuring a comprehensive application of the oil in your beard. And bingo! You are all geared up to become the center of attraction with all eyes rolling on you. For best results use Invigorating Beard Wash and Beard Growth Oil every morning & night before sleep. Store in cool & dry place, keep away from children & eyes. Pour 6-8 drops into palm (about the size of a coin) and rub hands together. Run hands through beard starting from the neck and working up, making sure to rub oil into the skin where your beard grows.